In the minds of some, complying with the US Foreign Corrupt Practices Act and related laws such as the UK Bribery Act is easy: ‘you just don’t bribe’. The reality, as sophisticated professionals know, is not so simple. 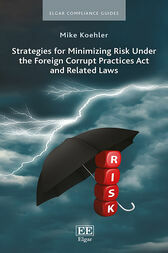 This book is for professionals across various disciplines who recognize the difficulties of compliance and want to learn strategies for minimizing risk under aggressively enforced corporate bribery laws. The book uses issue-spotting scenarios to present risk and guides professionals through various components of compliance best practices from the fundamentals of conducting a risk assessment and effectively communicating compliance expectations, to implementing and overseeing compliance strategies.